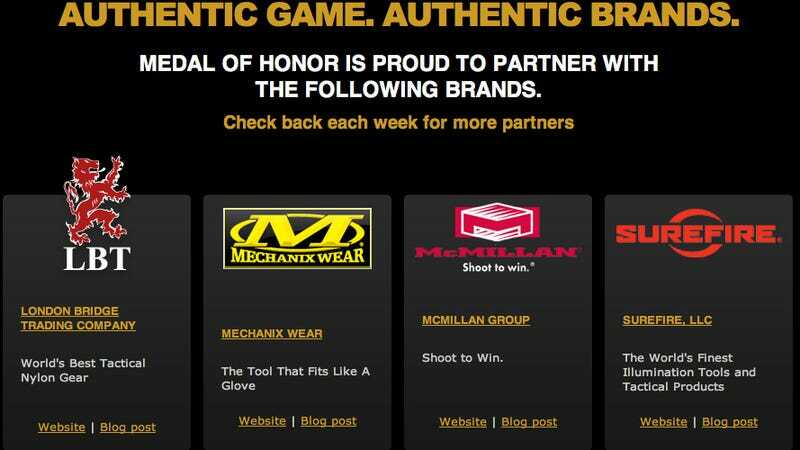 Earlier this week, Electronic Arts came under fire for hosting links to the websites of companies that sell and make assault weapons and tactical gear on the Medal of Honor Warfighter website. Those links—connected to items that players will be able to use in the game—were accompanied by blog posts written by Warfighter producer Greg Goodrich. A write-up on the Gameological Society was among the first that took the publisher to task for the close linkage between the new Medal of Honor game and the sale of actual weapons. Today, EA has pulled the links page to those weapons and gear sites and ended the special Tomahawk promotion that drew much of the ire from critics. "That was an effort to raise a lot of money for charity, and we were well on our way to raising a lot of money with that tomahawk, but I don't know what will happen with that now. That whole effort, we've been working with those partners because we wanted to be authentic, and we wanted to give back to the communities. Every one of those partners, none of them paid a dime for product placement - all the money generated went to Project Honor." To be clear, most of those partnerships appear to be still in place; it simply looks like EA is no longer promoting them on the Medal of Honor website.